July 8, 2014 By Elizabeth Lindemann 2 Comments / This post may contain affiliate links. We seem to be eating Italian food at least three times a week lately (something about summer just really makes you want pasta, if you ask me), so I always make sure my freezer is stocked with homemade marinara sauce. But I just ran out! Ahhhh! So, I’m sitting here making a double batch of it to restock my freezer until the apocalypse happens (or, until a few weeks from now). 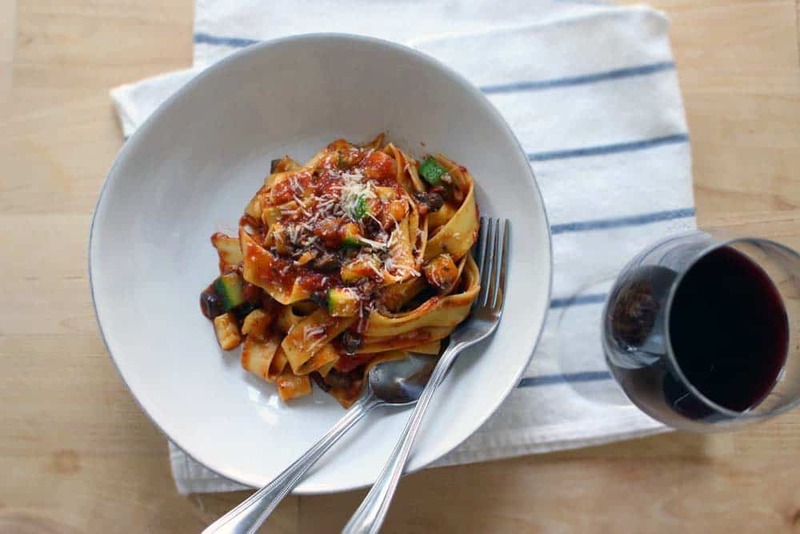 While it’s cooking, I’ll share with you the last thing I made with the previous batch: a super easy, super quick pappardelle with zucchini and mushrooms. This is seriously delicious. And I’m serious, it’s SUPER easy and quick. It’s all the things I love in a home-cooked meal: cheap, fast, healthy, and tasty! The entire dish, start to finish, takes about 20 minutes. As the pasta is boiling, just saute some chopped zucchini, mushrooms, and garlic in olive oil with salt and pepper for a few minutes, then add marinara sauce and heat up. Add the cooked pasta to the pan and you’re done! What sautéing mushrooms, zucchini, and other “watery” vegetables, it’s a good idea to give them a stir and let them sit for a few minutes without touching them. This will allow the water to release and evaporate, causing the vegetables to brown, rather than remain soggy. 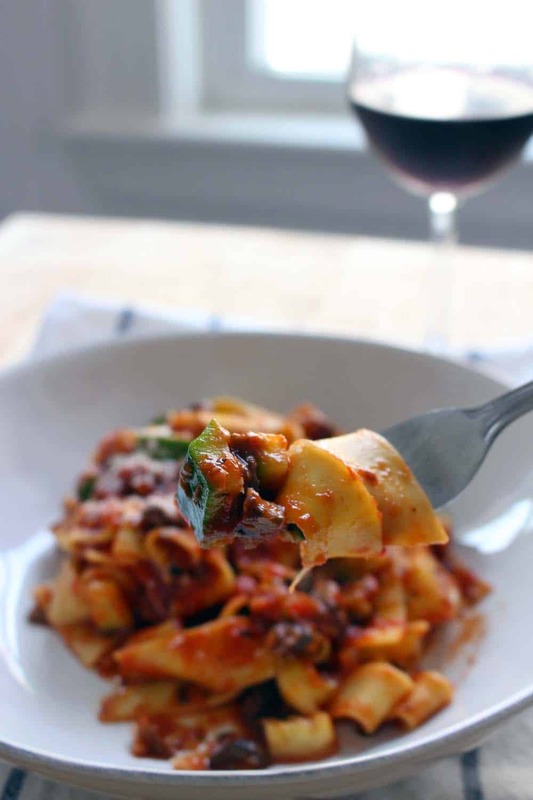 Confession: I did not use whole wheat pasta for this (GASP!). OK but Trader Joe’s has this amazing egg pappardelle pasta that is just soooo delicious. And $2! And yes, I am aware that I talk about Trader Joe’s a lot. I would like to remind you that I am a girl who loves healthy food and bargains. Which is what Trader Joe’s is all about. 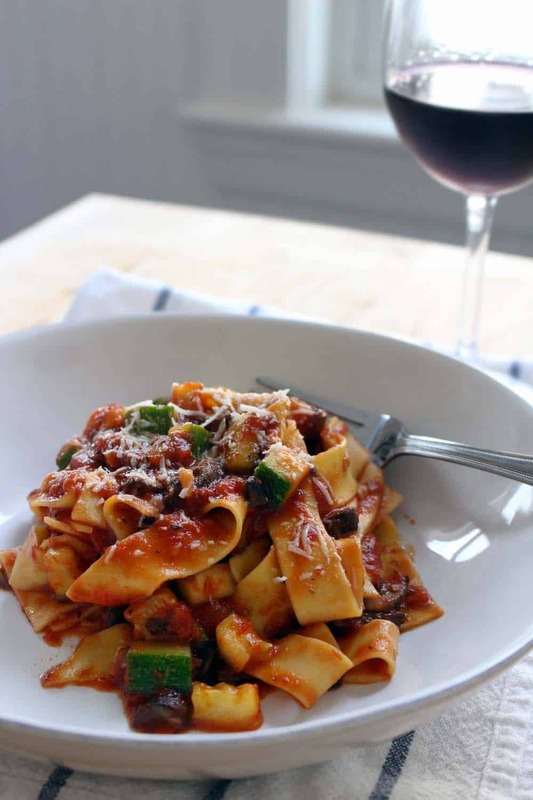 The good news: If you want whole wheat pappardelle pasta (which, by the way, is like a delicious, thicker fettucini), you can get it on amazon! 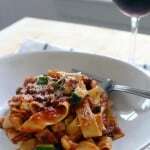 Of course, you can just use spaghetti or fettucini instead of pappardelle if you want to. I promise it will be just as tasty. When you add the pasta to the sauce, add it just after draining. There will still be some starchy pasta water attached to the noodles, making the sauce stick a little better. Serve with parmesan cheese and fresh ground pepper (omit the cheese for a vegan option). A super quick and easy meal for a busy weeknight- just saute zucchini and mushrooms, add marinara sauce, and add cooked pasta! A healthy, tasty, cheap vegetarian meal. Add marinara sauce to vegetables, stir, and allow to heat up. Drain pasta and add to sauce and stir. Serve with parmesan cheese and extra pepper.